In fact, the 20-by-20-foot trade show booth used by the Uniwood®/Fome-Cor® Division of Nevamar Company is created almost entirely out of Gatorfoam, one of the signature products in our Gator™ and Fome-Cor board lines. Ninety-six 12-inch rotating Gatorfoam cubes, decorated with vinyl graphics featuring digitally printed marketing images, are attached to the 18-foot-tall booth’s metal framework. Gatorfoam is perfect for mounting images (in both dry- and pressure-sensitive operations) for booth display. Exhibit pieces created from Gatorfoam also may be screen printed and painted with any water-based paint system and cut with standard woodworking tools. While exhibit and promotion pieces generally are constructed elsewhere for trade shows, attendees at PMA 2003, sponsored by Photo Marketing International in Las Vegas March 3-5, got an up close and personal look at printing/finishing processes. Marketing giveaways and display pieces were printed directly on Gatorfoam at the booths of several new digital flatbed printer manufacturers, then cut by automated digital high-speed router systems. 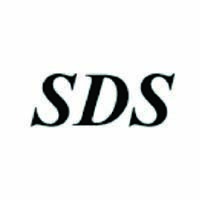 Following are two unique applications from Durst Dice America, LLC, and Sericol that really wowed the crowds, stimulating booth traffic and generating brand-name buzz for these exhibitors throughout the hall. Durst Dice America, LLC. As Rochester, N.Y.-based (DDA) continued its 2002 worldwide rollout of the Durst Rho160 UV flatbed industrial inkjet printer, the company sought an opportunity to showcase the digital printer’s capabilities at trade shows and to demonstrate realistic production workflow. The Durst Rho 160 is a high-performance large-format production inkjet printer capable of outputting directly onto rigid and flexible (roll-to-roll) materials without the need for dye-receptive coatings. The Durst Rho 160 can print panels up to 62 inches wide and 1.58-inch thick. The company teamed with Mikkelsen Graphic Engineering, Inc. (MGE) of Lake Geneva, Wis., setting up both the Durst Rho 160 and an MGE i-cut® automated digital die cutting system at DDA’s exhibit booth at SGIA ‘02, sponsored by the Screenprinting and Graphic Imaging Association in St. Louis Oct. 30-Nov. 2, 2002. DDA originally selected to print money puzzles with both the DDA and i-cut logos as trade show marketing tokens. But they also threw in an image of an electric guitar – due to a DDA employee’s love of playing air guitar. 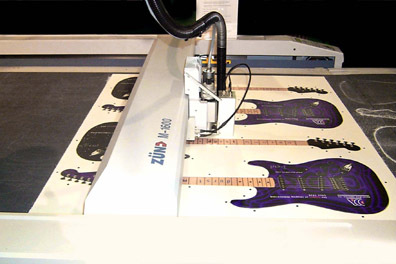 DDA chose to print the money puzzles and guitars at SGIA ’02 on 4-foot by 8-foot sheets of 3/16-inch heavy-duty Gatorfoam because the product holds ink well and is durable, according to Fosegan, who said lighter-duty paper-faced foam boards would have been a lower-cost alternative. Gatorfoam consists of extruded polystyrene foam bonded between two layers of Luxcell®, a sturdy wood-fiber veneer laminate. This unique construction makes Gatorfoam lightweight yet durable, rigid and warp-resistant; its surface also is exceptionally smooth and strong. Gatorfoam cuts cleanly and will not tear, chip or shred. By the time PMA 2003 rolled around the next March, the puzzle giveaways were history. The DDA/MGE team focused strictly on guitars, producing everything from one 7-foot tall guitar to sheets with multiple guitar images ranging from four to 42 inches long. All featured the DDA and i-cut logos. “We had people literally waiting in line for 15 minutes to get a guitar,” said Fosegan. 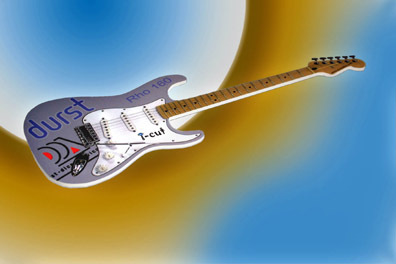 DDA/MGE took 2,500 pre-printed guitars to PMA 2003. Those were gone midway through the second day of the show, according to Fosegan, who said they printed and cut another 1,000 guitars to finish the show. Sericol, Inc. The Sericol Inca Eagle flatbed press using Uvijet UV curing inks offers edge-to-edge two-sided printing with instant drying on both rigid and flexible materials up to 1 5/8-inch thick. John Davies, digital application specialist at Sericol’s U.S. headquarters in Kansas City, Kan., said the Inca Eagle was used to print a number of small marketing giveaways directly onto various substrates at PMA 2003. 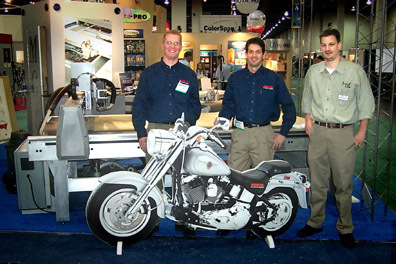 But, when it was time to print a two-sided life-sized image of a motorcycle as a cutout standee for their booth, they chose 1½-inch thick Gatorfoam graphic arts board in the 5-foot by 8-foot sheet size. Utilizing UV digital inks from Sericol, a leading manufacturer of UV inks, the life-sized motorcycle image was printed on the Inca Eagle in exactly 3 minutes and 45 seconds in the eight-pass mode, according to Davies. The printed Gatorfoam sheet then was flipped over and printed on the opposite side. The two-sided registration of the image was so close that printing came within 200 microns front to back, according to Davies. MGE employees cut feet from Gatorfoam to create a stand for the motorcycle, which was displayed prominently at Sericol’s booth. For more information about the Durst Rho160, call (585) 486-0340, extension 5225, or visit www.durstdice.com. For the MGE i-cut automated digital die cutting system, call (262) 348-0400 or visit www.mge-us.com. For the Sericol Inca Eagle, call (913) 573-3541 or visit www.sericol.com. Additional information about Uniwood/Fome-Cor’s Gator and Fome-Cor board lines is available by calling (800) 438-1701.